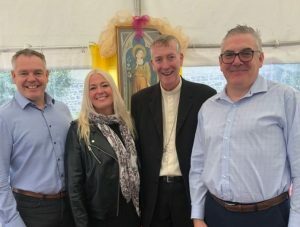 Families often don’t understand a religious calling, Bishop Denis Nulty said on Saturday as he marked the feastday of St Clare in Graiguecullen. In his homily at St Clare’s church, the Bishop of Kildare and Leighlin said he has met “mothers terrified of what might happen their son if he entered the seminary and was ordained”. Bishop Nulty recalled how her father and some of her family did everything possible to take her away from the influence of St Francis. They turned up at the Convent of St Paul where Clare was temporarily staying, asked for her and then stormed into the convent and tried to pull her from the chapel. She is reputed to have grasped the altar cloths and refused to budge. Her younger sister would in time steal away from the family, causing more heartache, and join Clare. Clare “didn’t come from a perfect family”. The World Meeting of Families celebrates family life, but no family is perfect, the bishop stressed. He suggested it was one word – simplicity. Referring to the visit of Pope Francis, Dr Nulty said that in two weeks’ time there will be pictures from the Capuchin Day Centre; “it will be the hug with the addict; it will be the embrace with the homeless family that will capture the eyes of the world media”. Elsewhere in his homily, Bishop Nulty recalled the history of the Poor Clare’s arrival in Carlow. They arrived originally at the Port in Drogheda and there was a chance for a while they might have settled in Stameen in Drogheda because complications arose around where they might live here in Carlow/Graiguecullen. After the long journey from Drogheda to Carlow, Mother Seraphine and Mother Angela arrived to see Bishop Lynch in Tullow. There was some initial hope that their Carlow foundation would be financed by a Drogheda merchant, but it didn’t come through! Bishop Lynch brought the two Sisters to the Brigidines in Tullow. There they were welcomed and fortified for their last journey from Tullow to Carlow.